In response to the mandate on Load and Resistance Factor Design (LRFD) implementations by the Federal Highway Administration (FHWA) on all new bridge projects initiated after October 1, 2007, the Iowa Highway Research Board (IHRB) sponsored these research projects to develop regional LRFD recommendations. The LRFD development was performed using the Iowa Department of Transportation (DOT) Pile Load Test database (PILOT). 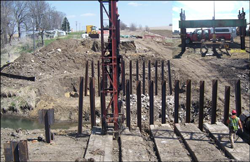 To increase the data points for LRFD development, develop LRFD recommendations for dynamic methods, and validate the results of LRFD calibration, 10 full-scale field tests on the most commonly used steel H-piles (e.g., HP 10 x 42) were conducted throughout Iowa. Detailed in situ soil investigations were carried out, push-in pressure cells were installed, and laboratory soil tests were performed. Pile responses during driving, at the end of driving (EOD), and at re-strikes were monitored using the Pile Driving Analyzer (PDA), following with the CAse Pile Wave Analysis Program (CAPWAP) analysis. The hammer blow counts were recorded for Wave Equation Analysis Program (WEAP) and dynamic formulas. Static load tests (SLTs) were performed and the pile capacities were determined based on the Davisson’s criteria. The extensive experimental research studies generated important data for analytical and computational investigations. The SLT measured load-displacements were compared with the simulated results obtained using a model of the TZPILE program and using the modified borehole shear test method. Two analytical pile setup quantification methods, in terms of soil properties, were developed and validated. A new calibration procedure was developed to incorporate pile setup into LRFD.